again for this summer we endeavoured to offer you a great variety of master classes with world famous teachers as well as a highly attractive program of additional courses, concerts and seminars. All our master classes and events take place in the lovely buildings of Mozarteum Foundation and Mozarteum University, located right in the centre of Salzburg, one of the most beautiful cities in the world, embedded in a dreamlike landscape of meadows, lakes and mountains. Here you can work with highly experienced masters, get inspired by our classes and events, make music together with talented young musicians from all over the world, have exciting discussions, learn from their playing or singing and build new friendships. For quite a lot of outstanding international music stars their participation at our Summer Academy was a decisive moment on the way to their huge career. May the same become true for you! Our new, completely revised and user-friendly online registration starts on February 20, 2019. Already now you may have a look at our master mlass overview, create your account and get familiar with the administration with the help of our guidelines. 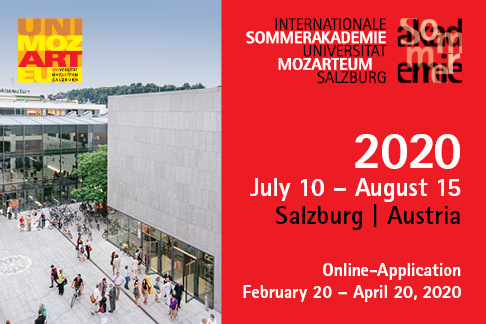 We - the staff of the Summer Academy - are looking forward to your arrival here in Salzburg in summer 2019!